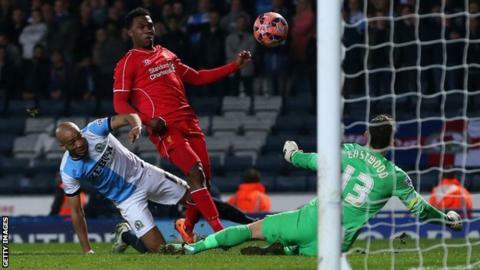 Liverpool striker Daniel Sturridge has flown to the United States to determine whether he needs surgery on an ongoing hip problem. The 25-year-old England international will visit Dr Peter Asnis, an orthopaedic surgeon based in Boston. Ansis has a history of working with the Boston Red Sox baseball franchise, who are also owned by Fenway Sports Group. Sturridge joined Liverpool for £12m in January 2013 and scored 24 goals in all competitions in the 2013-14 season as the Reds finished second in the Premier League. However, he suffered a thigh strain on international duty in September before injuring a calf in training in October. He picked up another thigh injury in November and did not play again until 31 January, when he netted in the Reds' 2-0 win over West Ham. Liverpool are fifth in the Premier League with four games remaining, seven points behind Manchester United, who occupy the final Champions League qualification place. Daniel Sturridge's absence has been keenly felt by Liverpool in recent weeks and there is a growing concern about his fitness.He was sent to the US over Christmas, when thigh and calf injuries were worked on by the Boston Red Sox medical department, and he will now return to the States in the hope the same doctors can cure the player's latest problem.Liverpool are working on a customised training plan for the striker to implement during pre-season, with Fabio Borini, Rickie Lambert and Mario Balotelli all earmarked for moves away from Anfield.